This game is also titled Yu-Gi-Oh! Shin Duel Monsters 2. Depending on the name used at the start of the game, you will get a different type of starter deck. Try names such as “Konami”, “Rod”, or “Puzzle”. Enter “Flame” as a name. This should show one of the starter decks with the deck leader Robotic Knight. Select this deck. This decks is powerful because it is full of machines, includes Wasteland (powers up all machines and allows them to move two spaces), and the machines will never have an attack lower than 1500. Enter the names “Kaiba” or “Scale” and choose the monster with highest number (on the left) to get a Kaiser Dragon (2300/2000). Look on the back of PlayStation 2 game cases. Look carefully to find sponsor names. Use those names as your name to get different cards. Not all names will work. Also, use the names of consoles such as “Nintendo”. Leave out the numbers. When starting the game, enter “Katsuya” as a name and choose Fairy King Truesdale as your deck leader. Your deck will be packed with insect and plant monsters such as two Hercules Beetles, a Kwagar Hercules, a Needle Worm, and a Great Mammoth Of Goldfine. Side with the Lancastrians (Red Rose) and duel Weevil at Chester. There is a good chance that you will win. Enter “Coke” as a name. You will now have the following. Deck 1: Serpentine Princess; Deck 2: Luminous Soldier; and Deck 3: Thunder Nyan Nyan. When using the Graveyard Slot Machine after you win a duel, get three cards in a line and get a slot rare. For example, get three Pumpkings to get a Toon Summoned Skull. Note: Getting three of the same cards in the slots does not always guarantee the same outcome. For example, 3 Rude Kaisers may result in an Anti-Magic Fragrance, Blue-Eyes White Dragon, Gorgon’s Eye, etc. Dark Magician 3 Gate Guardian Ritual Have Labyrinth Ruler summon the ritual to the field (does not have to be activated). Successfully complete both the White Rose story and Red Rose story to unlock map edit mode in custom battle. 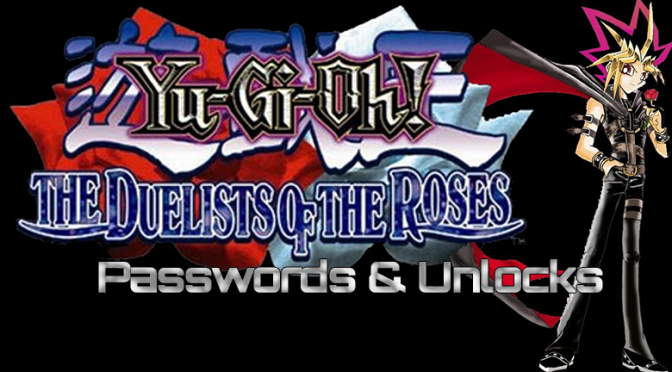 Successfully complete both the Red Rose and White Rose campaigns and have a PlayStation One memory card with Yu-Gi-Oh! Forbidden Memories saved game data in slot 2. Go to “Custom Duel”, and instead of dueling Deck Master K, you will duel Deck Master T. Deck Master T’s leader is Exodia The Forbidden One, and his deck only consists of magic/trap cards and the other four pieces of Exodia. Copy the saved game from Yu-Gi-Oh! Forbidden Memories over to a PlayStation 2 memory card. Insert it in slot 2. When you are in Custom Duel mode, it will show Duel Master S with a Goddess of Whim Deck leader. This trick requires only one memory card in the memory card slot. Go into the custom duel and set your deck up so that your best cards are in there. Both you and the CPU’s decks will have the same cards in them. When you win, the slot machine will be there and you can get your best cards repeatedly. This is very useful with Red Eyes, Blue Eyes and other cards that your have only one copy of. Use the following trick to duplicate cards and promote weak monsters. A second memory is not required. Go to vs. duel and Duel Master K. Make the card you want to duplicate your leader, play the Duel Master in the default crush field. Note: Make sure you have some monsters under 1500 ATK. Do not use any field cards. Instead, Duel Master K will at the most send out one or two monsters. Destroy these and defeat him in battle. Because he has the exact same deck as you, he will have the same deck leader. In the slots, the deck leader will be there. Get the monster you want in the slots. The battle is easy. The longer the battle the better, as this helps promote weak monsters. Use the following trick to multiply your good cards, get rare cards, and practice the Graveyards Slots. After clearing the game, the “Edit” option appears in a custom duel. You can edit the terrain to make all of the summoning spaces around your opponent labyrinth. Once the duel starts, pass your turn and your opponent will be forced to forfeit. You will then be able to play the slots with only your deck leader (against Deck Master K) in with nine Fake Traps. When a monster gets a Terrain Field boost, flip it face up and it is allowed to move two squares at a time. Move Mirror Wall either to the far bottom left square or far bottom right square. Put your leader next to it. Start securing your leader and Mirror Wall with monsters. Start advancing weak trap or magic cards (for example, Fake Trap, Forest). Mirror Wall will activate and your opponent’s monsters will be too weak to battle. You will still get the monsters in the Graveyard, since your opponent attacks all facedown cards. Depending on which monster you have, you should go against certain opponents. If the monster you want to raise in rank has an attack power of 2000 to 2500, play against Tristan. If it is lower then that, then play against Tea. If it is higher, go against Joey. First, have as many of that monster in your deck, then kill every monster with that card. Do not add power-ups or attack the opponent’s LP with magic cards. You can then have more time killing the other monsters. Remember to kill the opponent’s deck leader personally with the card you want to raise in rank. This will usually give you a big boost for raising your rank. Note: This trick requires the Map Edit option and a controller with a auto-fire or slow feature. First, build Labyrinth around your opponent, except for one space. Put the monsters that you want to level up on the field. Make sure you use Ookazi or Tremendous Fire, etc. Set the controller on auto-fire or slow for Start. When the battle is over, you will have more Deck Leaders. Use the passwords to get Crush Card (SRA7L5YR), Mimicat (69YDQM85), Magician Of Faith (GME1S3UM), and Royal Decree (8TETQHE1). Reincarnate Crush Card to get Just Desserts. Keep combining the cards that not listed in this tip until you get the ones needed. Do not use Just Desserts until your opponent has five cards on the field and you have Royal Decree on the field. Use Just Desserts and inflict 1500 points of direct damage. The total damage will be 4500, which is more than enough. This strategy is effective against Grandpa if you want an Exodia deck. If you surrender five times, you will be able to reincarnate a card in your chest which will allow you to build your deck. Note: Getting five wins also lets you reincarnate a card. Press L3 to reincarnate. When you get to the point of reincarnating cards, copy your game to a second memory card. Continue on the copied game and reincarnate a card. Save your game and exit. Place both the copied save game and the original saved game in the PlayStation2 and trade the reincarnated cards from the copy to the original. You now have three new cards, and still can reincarnate a card. To do this trick, you must have activate the reincarnate option after you have played with the CPU five or more times. Save your game before going to reincarnate. Reincarnate any desired card, and if you did not like it, go to the main menu without saving your previous reincarnation. Then, go to “Continue” to try it again. Repeat this processes as many times as needed until you get the desired cards. Use Royal Decree, Mirror Wall, and some good monsters cards in your deck. Make sure you have a Green Kappa monster in your deck (or more if possible). Fab Lyrr will most likely start off by playing Riroku (power-up that uses half of your LP to power up his monster) and a Skull Knight or something similar with over 2000 ATK. Once that monster is on the field, go into the crush territory with your leader, play the Green Kappa face down until you are in striking range of his leader, and attack. The Green Kappa’s effect will increase his attack to over 4000 and destroy his leader in one shot. First, defeat the Labyrinth Ruler until you get a Shadow Ghoul or two, Then, go to the Tutor and use the Shadow Ghoul. Enter the labyrinth areas to turn it into a Wall Shadow, then use Reborn The Monster or Mimicat (Magician Of Faith to get back magic cards) to go and dig out Shadow Ghoul again and make another Wall Shadow. Do this as many times as needed(at least twice recommended, but three is best). Then, use the Shield And Sword card to switch the Shadow Ghouls attack and defense and give it 3,000 attack points. Also, use the Ancient Tree Of Enlightenment or a Royal Decree to keep traps from getting the Wall Shadows. The Ancient Tree Of Enlightenment is better, because you can turn it off by switching to attack mode after you move (turn it back on at the beginning of your next turn before you move) in case you have trap cards such as Shadow Of Eyes, Mirror Wall, or Goblin Fan out. The following are the card numbers that are recommended: 043, 123, 152, 655, 685, 687, (699, 824), 705, 736, 754, 814, 829. Have Ancient Tree Of Enlightenment in face up defense position. His effect allows no Trap cards to be activated when in this position. Use Aqua Dragon powered up with Horn Of Light. Move him into the Toonland terrain and keep advancing to Pegasus’ deck leader. When your opponent attacks (or when you attack), Aqua Dragon’s effect will be activated. The square occupied by Aqua Dragon will be turned into sea. This boosts Aqua Dragon’s attack by 1000 points (up by 500 for not being in Toon, which decreases its attack and another 500 for terrain bonus). His attack will be 3250, which should be enough to defeat anything. You can also use the water as a path for Suijin or other water monsters. Pegasus has no Rose card to give you. When you play in the crush territory, you can only play monsters with an attack power of 1500 — be careful. Aside from the normal monsters that have less than 1500 ATK and can survive in the Crush territory, there are Immortal Type monsters that can both enter the area, regardless of Attack Power, and gain a field power bonus of +500 points. When these monsters are destroyed in battle, they turn the surrounding spaces into Crush territory, literally leaving their mark. Copy Cat, Mimicat, and Monster Reborn allow you to manipulate the content of your opponent’s Graveyard and help narrow down it down for the Graveyard Slots (revived cards go to the reviver’s Graveyard when destroyed). Paralyzing Potion is another effective way to get monsters out of the way without sending them to the Graveyard, thus improving your odds in the Graveyard Slots. This trick can only be used when there is only one monster in the Graveyard possible of getting, as when you use the “Edit Map” trick. When using the slot machine, you can see the arrows on the side. As you can see, they are usually blinking. When they disappear, the card is on the other side of the slot. You can use this to your advantage. Place the needed card in your deck and destroy it in a custom battle (for example, Komori Dragon for the Blue-Eyes White Dragon or Dark Magician for the Dark Magician Girl). It may be helpful to place more than one card in the deck for higher chances of getting the desired card. Robotic Knight has a hidden ability that lets you have an extra shot at matching three cards in Graveyard Slots. It lets you now try to match three cards on the top row. You get this after you raise your rank to the first star with the yellow stripe. Any time that you gain a card through lining up three of a kind in the Graveyard Slots, you will get a new picture for that card in your chest. Some examples include: Blue Eyes White Dragon, Red Eyes Black Dragon, Summoned Skull, Gemini Elf, and Flame Swordsman. When using the Graveyard Slot machine after battle, get three cards that are required to get a ritual monster. If you do, you will get that ritual monster as well as the three cards. For example, win against Bones at Exeter and in the Graveyard Slots, get any Insect, Machine, and Zombie monster. Note: The cards only appear in the slots if they are used in battle; duel against opponents that have ritual cards. If you can raise the Dark Magician ranking to Major (star with the stripe), you will be able to perform the same extra slot try just as the Robot Knight. To summon Millennium, you have to have Curse Of The Millennium Shield and two cards with 2100 DEF. You first need to have the Curse of the Millennium Ritual and three monsters over 2000 DEF. When you summon the Millennium Shield, make sure you have a Shield And Sword Magic card so that you can switch out the shield’s defense to its attack, giving it a 4000 ATK. Mirror Wall (DC: 80) is a powerful card. Use it against a Blue Eyes. If any card (in this case Blue Eyes) attacks any of your cards, its attack is cut in half, making a Blue Eyes ATK 1500. If the card attacks again, it will be halved again, (Blue Eyes ATK 750). Blue Eyes can now be killed by the weakest monsters in the game. Reincarnate magic cards such as Mega Drain (DC: 75, Darknite with Chakra) or Creature Swap, and there will be a possibility of getting a Blue-Eyes White Dragon. Since Blue-Eyes White Dragon has a DC of about 55, try reincarnating high magic cards. To get the Red-Eyes Black Dragon, have Joey summon it. Defeat the Red-Eyes Black Dragon and get it in the Graveyard Slots. Have Joey summon it by combining his Metalmorph and his Red-Eyes Black Dragon. Defeat it, but you need to get the Red-Eyes Black Dragon and the Metalmorph in the slots. If you reincarnate Barrel Dragon, you will get three tough creatures or nice magics (for example, Sagna Of Thunder, Kazejin, Suijin, KaiserDragon, Harpies Pet Dragon, Skull Knight, Ryu-Ran, Coldwave, Solomans Lawbook, and Tremendous Fire). If you reincarnate a Royal Decree, it will give you three Suijins. If you reincarnate Suijin, you will naturally get good cards. However, the real payoff is that you can get Sanga and Kazejin. You can get them both at the same time. An easy way to give Swordstalker a strength of 3800 power attack points or more is to sacrifice all the monsters in your deck. Due to Swordstalker’s special effect, it will become stronger than those of the CPU. If you have mainly a monster deck with three Swordstalkers, this trick will be very useful. Start by repeatedly trying to combine all of your monsters except for your Swordstalkers. Then, try to send out your Swordstalkers. It will have a power of a 6300/5900 or more. Try making multiple fusions with one card and destroy the card. For example, Zombie + Warrior = Skull knight + Hard armor = Armored Zombie. You will have four cards gone instead of three. Do not forget to destroy your last card with your own leader. Face J. Shadi in a match and destroy his Zoa card. Do not use Monster Reborn on Zoa. Just get Zoa in the Graveyard Slots then face Joey. Defeat him and make sure you destroy a Metalmorph. Win Metalmorph in the slots and combine it with Zoa to get Metalzoa (3000/2400). In most maps, there is a hidden card somewhere on the map. In order to get these cards you must move your Deck Leader over a specific location on the map. You may have to complete the game as both sides for these cards to appear. For example, in all the battles at Stone Henge, move your Deck Leader to the center of the map, in between all the labyrinth terrain. There should be a different card there against each opponent. To be able to find and get the hidden cards on the field during a duel, your deck leader must be ranked as a Major (one star and one yellow line) or better. You must also have a deck cost that is lower than 1000. To find the cards, your deck leader has to have the ability to find cards (Hidden Ability) and you need to have completed both sides of the story. Many of the monsters are Immortal Type (strong in crush territory) and very powerful in terms of their effects (Souleater is great). Most of the magic cards are those that destroy all monsters of a specific type (usually the type primarily used by the opponent you get the card against, for example, Cold Wave, obtained against Rex Raptor, kills all dinosaur type monsters).